As the season of Christmas approaches, we pray that God will bless the people of Cork during the forthcoming Feast and during the year ahead. Christmas this year takes place against the backdrop of a threatened peace in so many parts of the world. The mass migration of our brothers and sisters, many of whom are Christian, from Syria, the plight of Rohingya refugees, the grave escalation in tensions with North Korea, and the increasing nervousness in relation to isolated but severe acts of terrorism throughout Europe and beyond serve as a reminder that our world still awaits the peace which the ‘Prince of Peace’ offers. This Christmas may we all have the gift of peace in our own hearts, homes, families and communities, and may it also serve as a reminder that we who profess faith in Christ have an obligation to work towards and for that peace. Nearer to home, the past year has brought an ever-increasing awareness of the problem of homelessness in our society. As well as the plight of those who are forced to live on our streets, we think too of those who live in hostels and hotels, and those who are finding it impossible to pay the ever rising cost of rent. Given the plight of the Holy Family on that first Christmas night and their difficulty in finding accommodation, surely our celebration of Christmas must acknowledge those who, in our own time, are in the same situation? In that regard, the people of Cork owe an enduring debt of gratitude to those who work tirelessly and selflessly in our City for the homeless and underprivileged. At this time, one thinks of SHARE, the Society of Saint Vincent de Paul, Cork Simon Community and Cork Penny Dinners. There are many more who do what they can and more. One happy feature of the Christmas season is that of family reunions. Given the large number of people who left Cork to find work in recent years, our airports, ferry ports, train stations and motorways will be very busy as people travel to celebrate the birth of Christ with their family. We pray that all our families will experience the warmth and joy of the Christmas celebration. As Bishops of Cork, we appeal once again to all believers to keep Christ at the heart of Christmas. For the believer, the holiday is only happy because of the birth of the Saviour. Christmas literally means the feast of Christ. Let’s keep Christ in Christmas. This Christmas may be a time when people might reflect on and rediscover that Christmas offers us more than a commercial mid-winter festival. We wish you peace, joy, warmth and happiness for the celebration of our Saviour’s birth. We will remember in prayer those who have lost loved ones during the past year. We pray particularly for those who have been touched by the tragedy of suicide. May the star which lit up the sky at the birth of Christ shine the light of hope and peace on all those who are suffering. We pray that 2018 will be a time of happiness for our families, a time of blessing for our city, county and country, and a time of peace for our world. May Christ find a welcome when He comes, and a Happy Christmas to you all. Bishop of Cork, Cloyne and Ross Bishop of Cork and Ross. 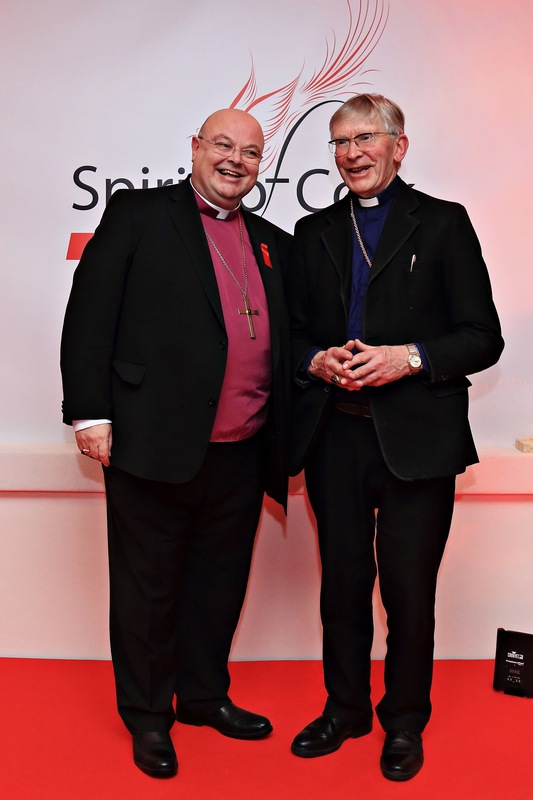 Bishop Paul Colton and Bishop John Buckley at an event in Cork recently.